Article: Will Steffen, Johan Rockström, Katherine Richardson, Timothy M. Lenton, Carl Folke, Diana Liverman, Colin P.Summerhayes, Anthony D. Barnosky, Sarah E. Cornell, Michel Crucifix, Jonathan F. Donges, Ingo Fetzer, Steven J. Lade, Marten Scheffer, Ricarda Winkelmann, Hans Joachim Schellnhuber (2018). Trajectories of the Earth System in the Anthropocene. Proceedings of the National Academy of Sciences PNAS. Impressions from our 2018 expedition to Antarctica on board research vessel Polarstern, led by Alfred-Wegener-Institute for Polar and Marine Sciences. 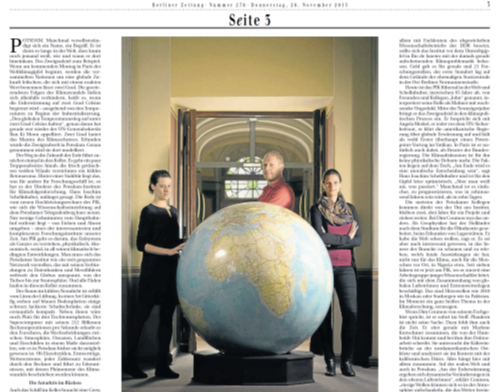 A Science Blog in Frankfurter Allgemeine Zeitung by Ricarda Winkelmann and Ronja Reese. 2017 - Wie war das Jahr? 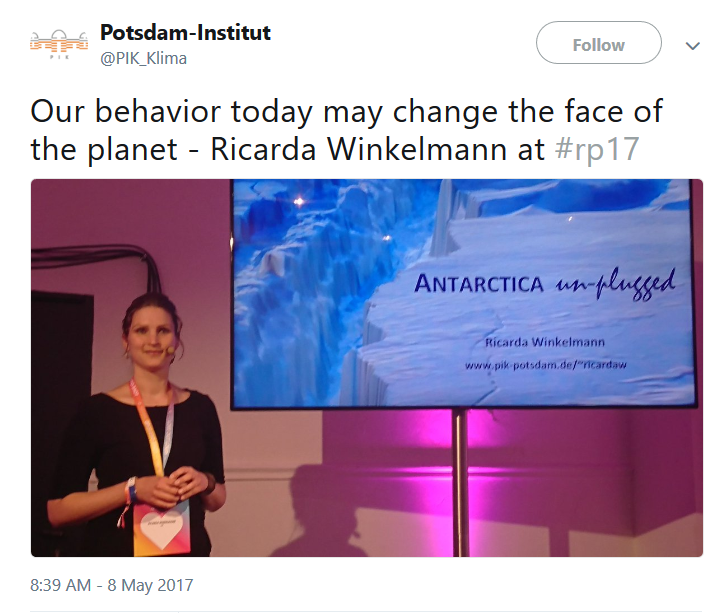 The 2017 Division Outstanding Early Career Scientists Award is awarded to Ricarda Winkelmann for her innovative contributions to glaciology and the study of the interactions between climate and glaciation. Klima-Experten ziehen wissenschaftliche und politische Bilanz. MOOC 2015: Climate change - a question of justice?